For first-time buyers, picking the right kayak can be confusing. Let’s look at what we should know and consider when it comes to buying a kayak for beginners. We also review best starter kayaks that are good for beginners. Kayaking is such a great sport and a workout exercise. The water sport can include everyone, whether you are a beginner or a professional. The ranges of available boats and the environments in which you can paddle to offer an experience for almost any person to enjoy. Still waters like lakes and calm rivers are the perfect places for any notice to get started. You can enjoy the scenery or work on your paddling skills. As you become better and familiar with your boat, you can be more adventurous and venture into choppier waters with bigger waves and splashes. Starting out, there is no sense in getting caught up with the more expensive kayaks. We are talking about the ones that cost over $1,000 with features you might not get around using. Once you decide kayaking is your thing, we can look into specialized designs such as angler kayaks. The good news is that there are many relatively inexpensive yet durable and stable kayaks for you to start out in. So let’s take a closer look at what needs to be considered, and get you out onto the water as soon as we can. What really is the difference between a beginner kayak and an intermediate one? How can we tell the difference? We are going to equip you with the basic knowledge, before getting more specific i.e., where you want to go kayaking, do you want to go kayaking with someone? A good kayak needs to be stable and durable. This is because while you are still on the learning curve, your boat is undoubtedly going to sustain a few knocks! This is not a bad thing, and they should be built for a little rough and tough while you are learning. It should also be affordable. You don’t jump straight into any sport and immediately buy the best gear on the market. For all you know, it could not be for you and you’ve just blown hundreds of dollars. You can still enjoy the sport without spending too much money. Once you are committed to kayaking, you can branch out and splurge on a some interesting features. Lastly, the boat should be safe. Although you are going to get wet and make some mistakes along the way, being out in the water is no joke. Wear a personal flotation device and make sure your boat is in a safe and usable condition. We know you’re surely getting excited now, but before you rush out and snap up a brand new beginner kayak, you need to ask yourself a few questions that will enable you to truly buy the best beginner kayak to suit your specific kayaking needs. What is your weight, and can your kayak support you with stability? Will you be starting off in very calm waters like lakes and slow moving rivers, or in rough and choppier waters like the ocean or whitewater rapids? Do you want to be out on the water for an entire day or shorter periods of time? How much gear will you be carrying with you? Are you interested in eventually making camp for the night during your trips out in the water? What is the climate and temperature of the body of water you will be kayaking? Are you going kayaking for leisure or do you want to exercise? Do you want to climb into a cockpit (sit-in) or a sit on top of the deck (sit-on-top)? Sit-ins and sit-on-tops are exactly what the name suggests. You sit inside of the cockpit of a sit-in and sit on top of the deck of a sit-on-top. Whether you buy one or the other depends mostly on the environment and your general preference. You may want to choose a sit-in boat and use a spray skirt for less exposure to the freezing water. Alternatively, a sit-on-top can be better for more tropical, warm water. Both types can become flooded as you paddle or face water waves. Many kayaks are designed to be self-bailing with scuppers (holes) for draining excessive water on deck or inside the cockpit. So which is better for a beginner? Both are great choices, and there is no wrong answer. Depending on the weather, the climate, the body of water, and your preferences, you may want to be inside or on top! If you enjoy the serene privacy and solitude of gliding across the quiet waters by yourself, you are going to want a one-seat boat. If you are going to bring a friend, family member, or furry best friend, a tandem is necessary. If you are unsure, we would consider opting for a tandem. However, there is no harm in ordering two single seaters! There are two different constructions available: an inflatable design or a rigid design. Inflatables are primarily made up of PVC, and some are made of a synthetic rubber called hypalon. These boats require a pump to inflate (and are usually are sold with either a hand, foot or electric pump). Inflatable boats are much easier to transport as they can be deflated and folded up. However, you do run the risk of punctures if you find yourself too close to the shorelines, sharp rocks, or paddling into a sharp log. All inflatable boats typically come with a single use repair kit. You can order more repair kits online, like this brand. Rigid boats are made with various plastics or fiberglass (some are even made out of wood). The specific material does dictate the price of the boat, as certain materials are more durable, reliable, and perform better. This type of material does make the kayak difficult to transport with greater weight and size but last longer. These boats are great for a relaxing day out on calm water. They can also be ideal for novices with less features and lower price. Recreational kayaks are characterized by larger cockpits for easier entry and exit or wider, usable deck space. They also tend to have a wider hull and are not built for speed. You can find both recreational single seaters or tandem selections. In any case, the cost tends to be on the lower price spectrum with fewer available features such as storage compartments and mounts for holding rods. This type of boat is generally smaller and are constructed with safety in mind. Open water kayaking can be a bit more dangerous with stronger waves involved. You can find this type of sea/ocean kayak is available as either sit-in and sit-on-tops. If you enjoy fishing and want to consider doing so while out in the water, you might be interested in a beginner fishing kayak. These boats can be either sit-ins or sit-on-tops and have good storage space for tackle boxes, coolers, and other gears. They can come with flush mount rod holders or adjustable swivel rod holders. They also come with deeper tank wells, bungee storages or cargo nets. Anglers are usually built for stability and tend to be wider for carrying more gear. Whitewater is not the ideal environment for kayakers starting out, but there are some beginner whitewater kayaks on the market. Whitewater boats are specifically designed to be able to take on rapid, intense waters and its nearby terrain, and make quick river-bending turns. Below we have compiled a list of the kayaks on the market that we believe are the best choices for those who are just starting out. We have chosen these boats based on the factors listed above, and have also included various pros and cons for each. The Quikpak K-1 is a solo inflatable kayak. It is a suitable choice for leisure time out on the lake. Being inflatable, it is easy to transport and get out onto the water, which is important for a beginner who might be going into the water alone. 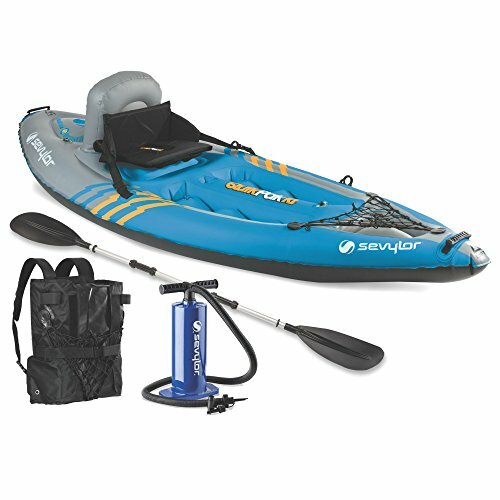 This inflatable boat comes with a hand pump, and even a cup holder to store your water bottle! The Aruba 10 is a lightweight, solo, sit-in recreational kayak. This boat is easy to get in and out of for a sit-in. 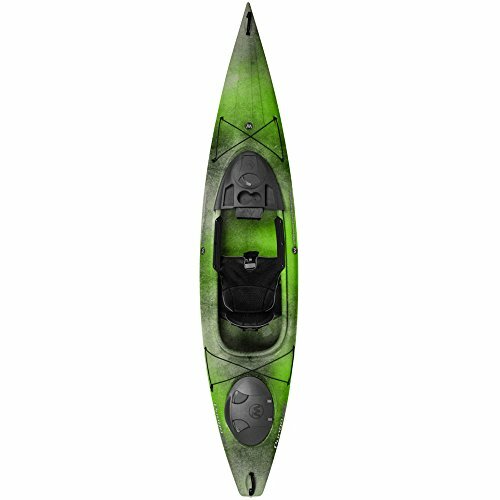 It is affordable, and can be considered the epitome of a perfect starter kayak! The Malibu is a great tandem kayak for beginners! This is a very stable sit-on-top, which makes it a popular tandem choice on the market. It can seat up to 3 people (two adults plus a child, for example). Although it is a tandem, the Malibu can also be used for solo trips. Exterior: 14' x 39" / Weight: 42 lbs. / Interior: 13' 4" x 15"
Load Capacity: 2-3 Adults or 855 lbs. The Sea Eagle 420X is a two or three-person seater inflatable boat. If you are getting into kayaking with your friends, this boat is a suitable choice. The seats are adjustable and removable so you can tailor your setup to what you want to do for the day. When inflated, the Sea Eagle 420X weighs 42 pounds (20 kilograms), making it light-weight and easy for hauling to and from the water. 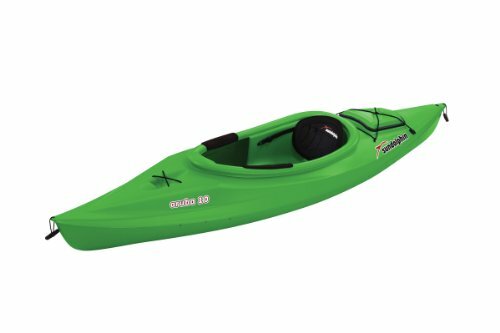 The Pungo 120 is a great sit-in, recreational kayak for beginners that are interested in hitting the river. It weighs 49 pounds (or 22 kilograms) and has a weight capacity of 325 pounds (147 kilograms). It is a fast and stable single seater. 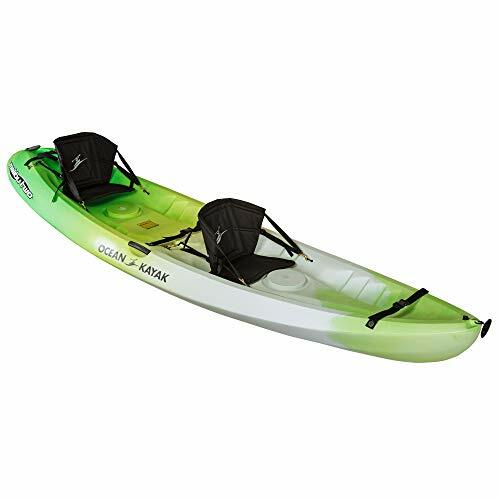 The Skylark is a sit-in solo kayak that comes in at 12 feet long and 26 inches wide. It is fitted with adjustable foot braces, which give extra support and encourage proper posture. The boat is light-weight and made with durable co-extruded ABS material, and is abrasion resistant. You can paddle across a shallow river bed by accident and the Skylark can survive. 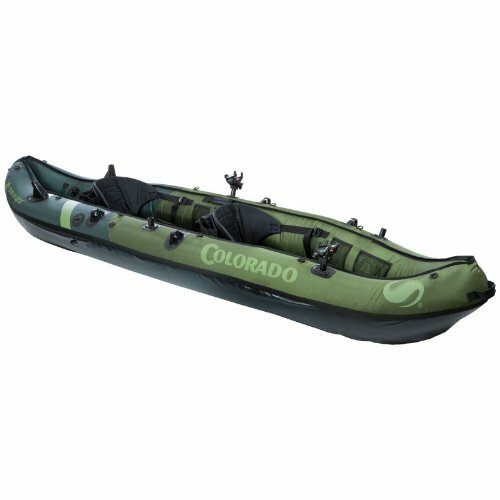 The Coleman Colorado is the perfect tandem inflatable kayak for beginners. It is built for fishing, which is not normal for an inflatable boat. The vinyl material is heavy-duty durable and puncture resistant. The maximum weight capacity is 470 pounds (213 kilograms), which is plenty for two adults and carrying on extra gear.